"OMG!, what did I get myself into?" 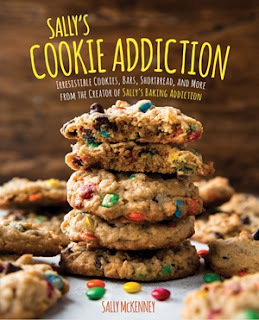 This is what I said when I recently received the new cookie cookbook from Sally McKenney, to review. Sally's Cookie Addiction: Irresistible Cookies, Cookie Bars, Shortbread, and More. You may have heard of Sally's Baking Addiction...this is "take two" with even more delectable cookies, shortbread and more. If you are on a diet, I strongly advise you to look away as I share more about this must have cookbook for cookie lovers and bakers. "Bake exquisite cookies, bars, and doughs perfectly every time with Sally's Cookie Addiction. A world of baking wonder awaits you and all the lucky people you’ll share these treats with. The best part? In Sally's Cookie Addiction, Sally will tell you how to make each and every cookie in the book ahead of time. So, if you want to start preparing for the holidays, or if you just like keeping cookie dough in your freezer for those critical cookie emergencies, this is your source. Complete with tips on how to bake the perfect cookie and gorgeous photography, Sally's Cookie Addiction is the only cookie book you need on your shelf. Prepare for your kitchen to be the most popular room in the house while the smells of Warm Chocolate Chunk Skillet Cookies, Lemon Crème Sandwich Cookies, and Soft-Baked Sugar Cookie Bars emanate from the oven!" Even though I wish my girls could stay little a little bit longer, I do like how they are old enough to help out more in the kitchen and want to learn how to bake and cook. Cookies and pastries, just like their mom, are their weaknesses. We make a point every Sunday to do a little baking in our house. My husband starts the morning by making pancakes with the girls, in which they add all sorts of tasty toppings. Then, once all the dishes are cleaned up and put away, the girls start to pull out cookbooks, sifting through the pages to find a recipe to make with me. We started doing Pancake Sundays, followed by "Baking with Mommy" last year, and the whole family looks forward to it, each and every week. Usually my husband will remind the girls Saturday night that Sunday is pancakes, and the girls get all excited. They love getting in the kitchen with Daddy and making pancakes, and then helping to cut the fresh fruit to top their pancakes with, before adding lots of powdered sugar, whipped cream and maple syrup. After the sugar rush of pancakes in the morning, the girls add to their sugar cravings with baking with me. And, thanks to this new cookbook, filled with tons of irresistible cookies, bars, shortbread and more recipes. I attempted to count up all the recipes in this cookbook, but lost count, partly because of all the mouth watering full color photos of each of the recipes, and because as you flip through this cookbook, you just want to get in the kitchen and start baking up each and every recipe. Classic Chocolate Crinkles (I personally loved these, and they reminded me of ones my Italian Nana used to make at Christmas...definitely marked to make again soon, and for the holidays. If you are a chocolate lover, like me, then you will love this book, as it has lots and lots of recipes that call for chocolate. And, you know what that means...you need to taste test the chocolate before adding, and leave a few handfuls out for snacking. :-) Come on, you know you do it, too! 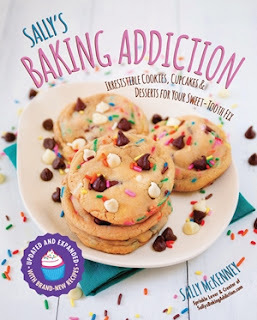 After seeing this cookbook up close, and trying out a handful of recipes, all of which are easy to follow along and make, I will definitely be picking up Sally's other cookbook, "Sally's Baking Addiction," which includes recipes for cookies, cupcakes, and other mouth watering desserts. So, what are you waiting for? Wipe you mouth from the drool just thinking about these two cookbooks from Sally McKenney, and order one or both cookbooks to add to your cookbook collection. Then, get in the kitchen and get baking up these tasty cookies and treats for family and friends to enjoy.